← How do you improve your photography? This is a guide to what you should be doing each time you take a shot. In anything needing skill, the details make or break the outcome. Examining the steps in the process of taking photographs gives us an important insight. I have designed the free infographic for you so that you can think about the process of taking photographs in its full detail. Each step in the graphic brings out skills I have written about on this blog. The different steps in taking photographs can be related to articles and definitions posted previously. 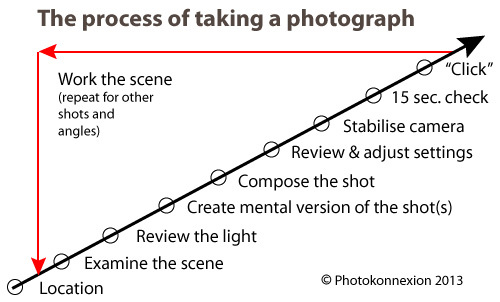 Infographic download – Process of taking photographs. (Full page print version – landscape). Tomorrow I will go through this infographic in detail. I will provide links and comments to show the meaning of each of step. Print off the graphic and think about what each stage means before reading the next article. Infographic download – Process of taking a photograph. Read: How to take each step in taking photographs (links to tomorrows article).